In 1973, Catalytic Generators revolutionized the fruit ripening industry when they invented a system that creates ethylene in ripening rooms. Today their products are used worldwide to easily and safely ripen fruit. 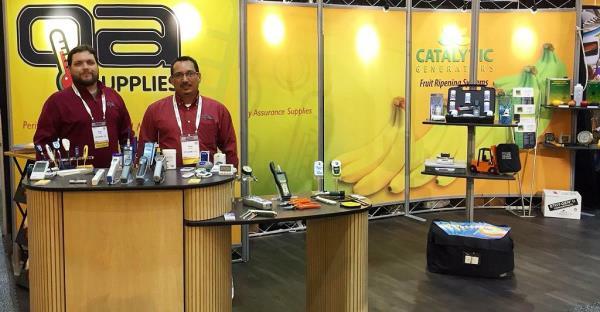 Catalytic Generators will be showcasing their ethylene generators and Ethy-Gen® II Ripening Concentrate at the Produce Marketing Association Fresh Summit Convention & Expo at the Orange County Convention Center in Orlando, Florida October 18-20th at Booth 2335. As the only ethylene generator company with products certified by both UL and TÜV, the efficient and dependable Ethylene Application Systems of Catalytic Generators allows fruit companies to make and control the amount of ethylene produced in ripening rooms for a safe and easy application. Through the utilization of this process, small, uniform amounts of ethylene result in uniform fruit ripening with better color. Catalytic Generators offers several types of ethylene generators designed for fruit ripening and degreening, each with its own unique advantage. The world-renowned flagship generator of Catalytic Generators is the Easy Ripe® Ethylene Generator. Portable, efficient, and easy to use, the Easy Ripe® works by simply placing it in the ripening room, plugging into a properly grounded electrical outlet, selecting a conversion rate, and pouring in Ethy-Gen® II Ripening Concentrate. A highly visible green light indicates the operation status of the generator while safe, non-pressurized ethylene is provided on a continuous basis. Ethylene output can be adjusted for multiple size rooms, meaning the Easy-Ripe® can adapt to any ethylene PPM requirements. Catalytic Generators has developed the Easy Ripe® to work with a computerized ripening room control system and have wall-mounting options. The Ethy-Gen® II Ripening Concentrate used in Catalytic Generator’s ethylene generators features a hermetic, leak-proof, and tamper-evident seal to assure customer that the contents haven’t been tampered with and that the original purity remains unchanged. The company has invested in a lot coding process, as well, which places an identifying code on each bottle. Should a customer be involved in a recall of a ripened fruit product, Catalytic Generators could rapidly trace a complete history of the Ethy-Gen® II used to ripen the fruit, from manufacture date to bottle date.